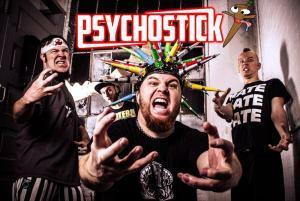 April 26th Friday - Psychostick is going to literally murder the Lefty's stage. 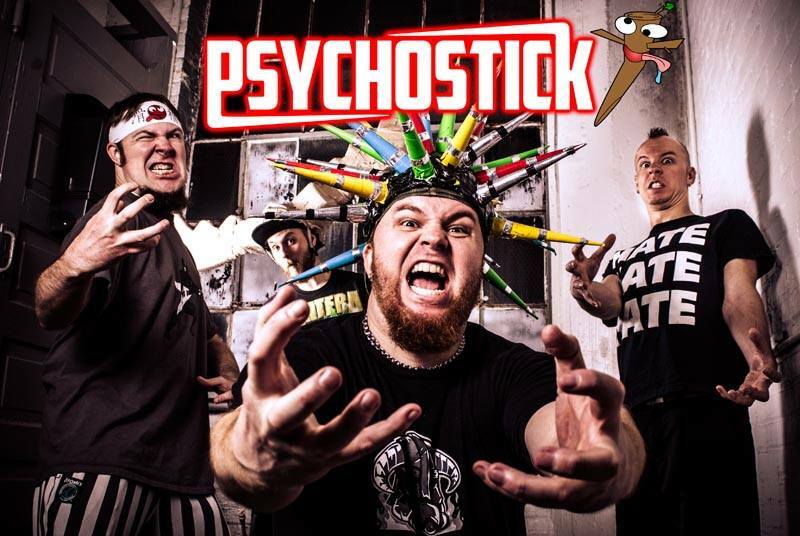 Psychostick - What happens when two best friends who grew up listening to Weird Al and Pantera decide to start a band combining crunching riffs and laugh-out-loud lyrics? Psychostick happens, happened, and continues to happen. Vocalist Rob Kersey and guitarist Josh Key teamed up with drummer Alex Dontre and Matty J "Moose" to create some of the most off-the-wall records to ever reach store shelves. Backed up by a fleet of viral-sensation online videos and an insane live show that few can forget, Psychostick has proven year after year that they refuse to be ignored. And the fans wouldn't have it any other way. Now residing in Chicago, IL with five hard-hitting comedic albums behind them – "We Couldn't Think of a Title" (2006), their holiday album "The Flesh Eating Rollerskate Holiday Joyride" (2007), "Sandwich" (2009), "Space Vampires vs. Zombie Dinosaurs in 3D" (2011), and "Revenge of the Vengeance" (2014), - the nearly 100 percent do-it-yourself band Psychostick throws down their latest ridiculousness, "Do". Featuring an eye-brow raising track list that includes previously released singles such as the notorious "Beer!" song, the manly beard anthem 'Obey The Beard' (http://youtu.be/q0kSuZFOwFE?t=4s) and over-night internet hit 'Dogs Like Socks', (http://youtu.be/swmuqGWgZCc) plus new tracks 'Quack Kills', 'So. Heavy. ', 'Blue Screen', and a tribute to the 21st century's most beloved action super hero 'Bruce Campbell," Psychostick aims to please their cult-like following while maintaining steady growth as new fans discover this one-of-a-kind project.